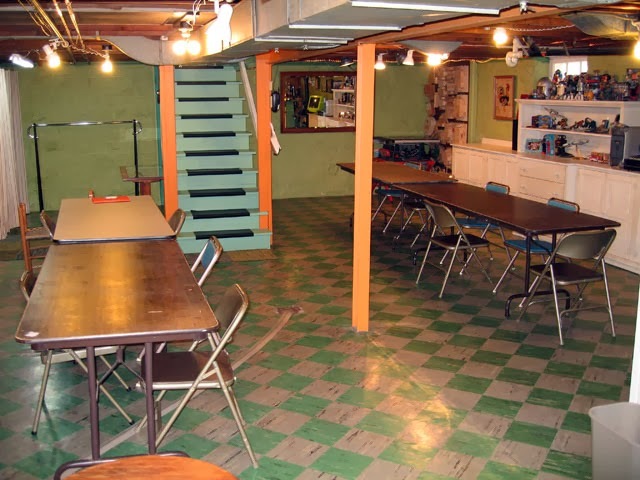 Well, this is what the basement is supposed to look like in anticipation of my JoAnn Kelly Catsos workshop in a few weeks (Nov. 9-12, 2013), but I have a long way to go still. I have been working on it this weekend and it is looking better, but where did all this crap come from? I am a hoarder in waiting I think (or am afraid). I will get there. I am in purge mode, so am gathering up stuff to donate and to sell. Look for class photos as they happen in a few weeks. I will be posting them on my facebook and instagram pages. I know your father. If you are a hoarder, I know where you may have gotten that trait. . . . :) Have fun! I don't consider you a hoarder in any way, shape or form! Guess that means I may be one as well?? I love your workshop area... all your collectibles, the cool bar, your awesome retro floor! I love it all! Say hi to Miss JoAnn! !